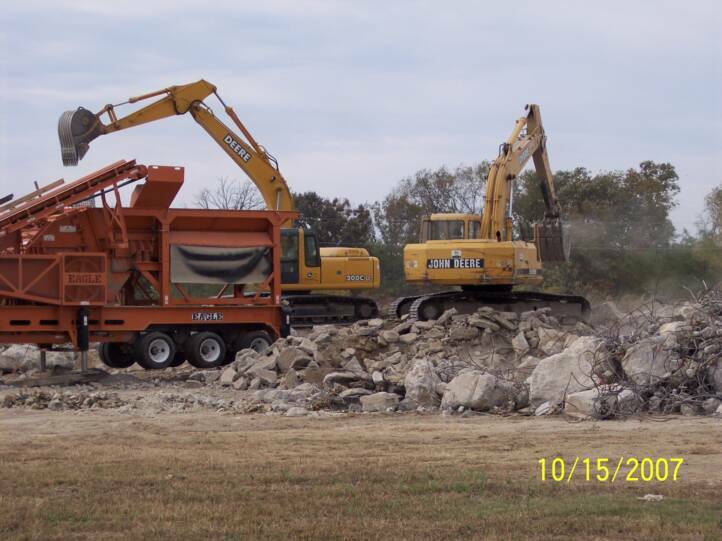 Bromley Excavating & Recycling provides concrete crushing and asphalt crushing services, as well as demolition and heavy equipment excavating. Located in Southern Illinois, we have been serving the surrounding area since 1989. We offer on-site concrete crushing and asphalt crushing with our mobile Eagle 1200-25CC crushing plant. Our plant can be transported to your site and set up and crushing in a matter of a few hours. It has a double-deck screen which allows us to produce two products simultaneously. The crushed aggregate is sized to your specifications, which is usually 3", 1 1/2",1 1/4", or 1" minus. We will come to your site and prepare the concrete/asphalt for crushing which includes providing the equipment and manpower to pile and size the concrete for feeding into the crusher. The crushed aggregate will be stockpiled on your site or can be used as backfill on your project.